In this special edition of What's Your Budget?, we take a look at some beautiful bathroom suites you can buy on a budget of £400, £600 and £800! Posted By Alan, 4th Jul 2018. 3 Minute Read. As you may well know, we've put together several bathroom suite WYBs in the past so we thought we'd finish off with a special feature of ‘What’s Your Budget?’ for bathroom suites. In this special feature we take a look at bathroom suites on a budget, but instead of 5 suites under X amount of money, we take 3 different budgets and focus on 2 great suites in each. So, without further ado, here’s 6 bathroom suites you can buy for a budget of £400, £600 and £800. What exactly is a bathroom suite? Typical bathroom suites consists of a bath, basin and toilet. The word suite has the potential to confuse and sometimes leads people to believe it’s a full bathroom with all the trimmings. Seasoned bathroom suite buyers will be all too familiar with the different packages available, but new buyers may not realise that with some suites, you may not even get a bath! It’s important to check out the package features of a bathroom suite before buying one you like the look of and don’t be scared of creating your own bathroom suite by mixing and matching individual products you think work well together. Below we have featured both modern suites and traditional bathroom suites which we think you’ll love, but if they're not exactly what you're looking for then we hope they can inspire you to create a unique variant of your own. At the end of each featured suite we have a 'Looking for something different' section to give you an alternative idea. How does the WYB special feature work? Unlike a typical ‘What’s Your Budget?’ feature which looks at 5 products you can buy under one budget amount, this special feature looks at 6 bathroom suites over 3 different budgets. That means we’re going to look at 2 suites you can buy with £400, 2 suites under £600, and then 2 more suites for an £800 budget. It’s true that traditional bathroom suites are hard to find at low prices. They tend to cost more than modern bathrooms because their contents are high quality and styled on a period look, but the Carlton Traditional Bathroom Suite defies budget logic. With a stunning traditional bath complemented by the Carlton toilet and basin, you get an elegant full bath suite which will look fabulous in any period bathroom. Imagine taking a long relaxing soak in that bath and drifting back to those years gone by. What could you buy with the change? You'll have a great deal of money left over from your budget if you choose this bathroom suite. 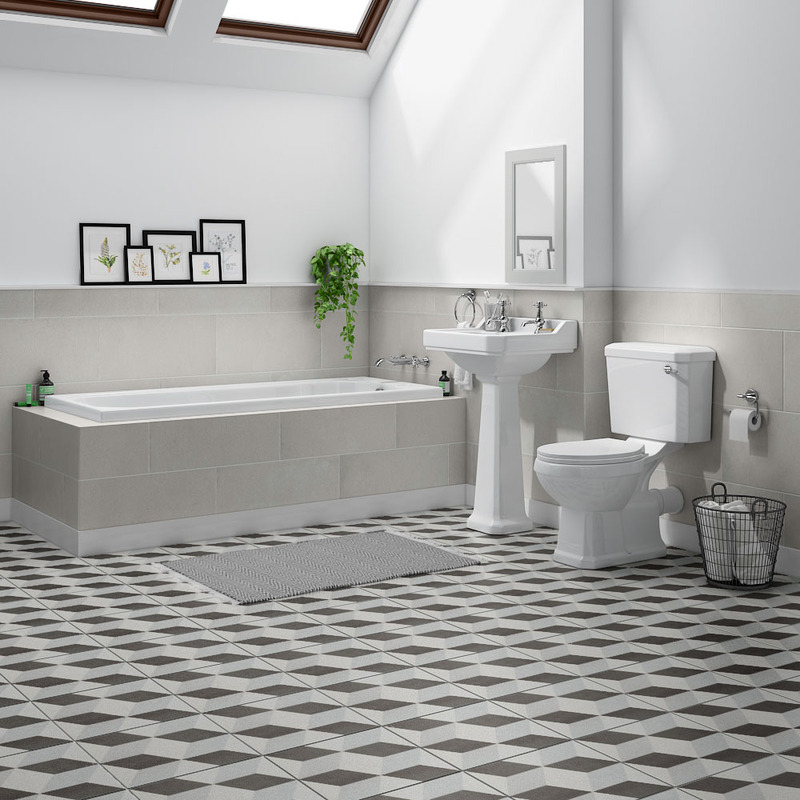 Your traditional bathroom will look amazing with some floor tiles. Consider patterns or monochrome for a totally traditional look! Looking for something a bit different? Take a look at the Legend Traditional Bathroom Suite for a different twist. A modern bathroom suite should be practical and stylish. The Ivo modern shower bath suite combines style and function by giving you an L-shaped shower bath, also known as a square shower bath, which will fit nicely into most of today’s modern bathroom layouts. Not only do you get lots of additional space for showering and bathing with L-shaped shower baths, but you also get the matching shower bath screen to prevent water splashing outside of the bath. The toilet is made from high quality ceramic and has a dual flush option; perfect for saving water. The gloss white finish of the basin creates an ultra-modern feel which ties everything together brilliantly. What could you buy with the change? Our advice would be to put your change towards the Acrylic End Panel for 1700mm L-Shaped Baths if your shower bath isn’t being fitted against the wall. This will finish off the look beautifully. Looking for something a bit different? 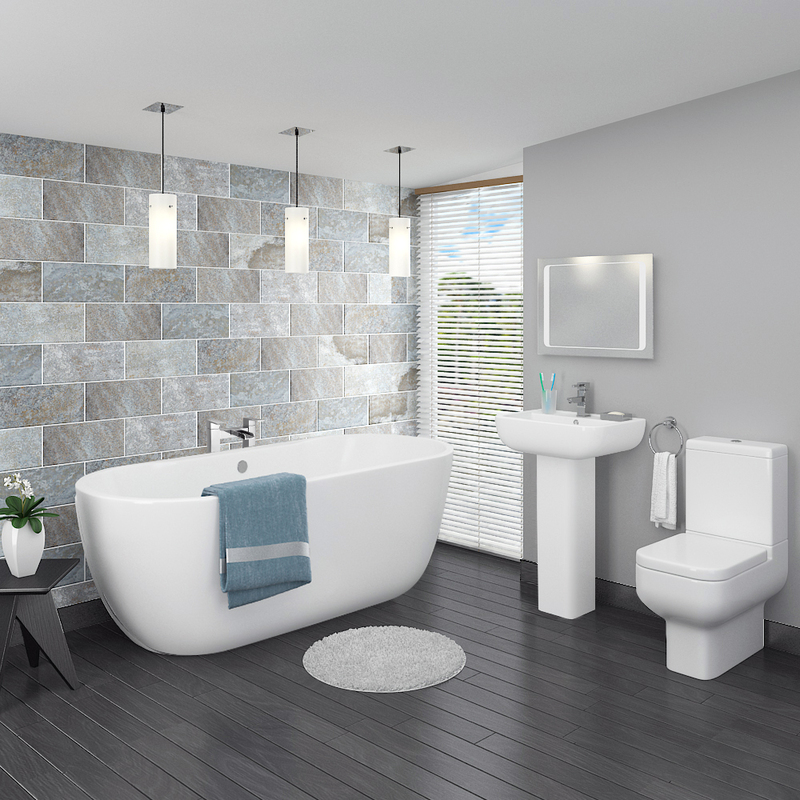 Take a peek at the Premier Bliss 5 Piece Bathroom Suite for an alternative style. If you want to evoke a really authentic classical look then turn your attention to the Carlton traditional bathroom suite. 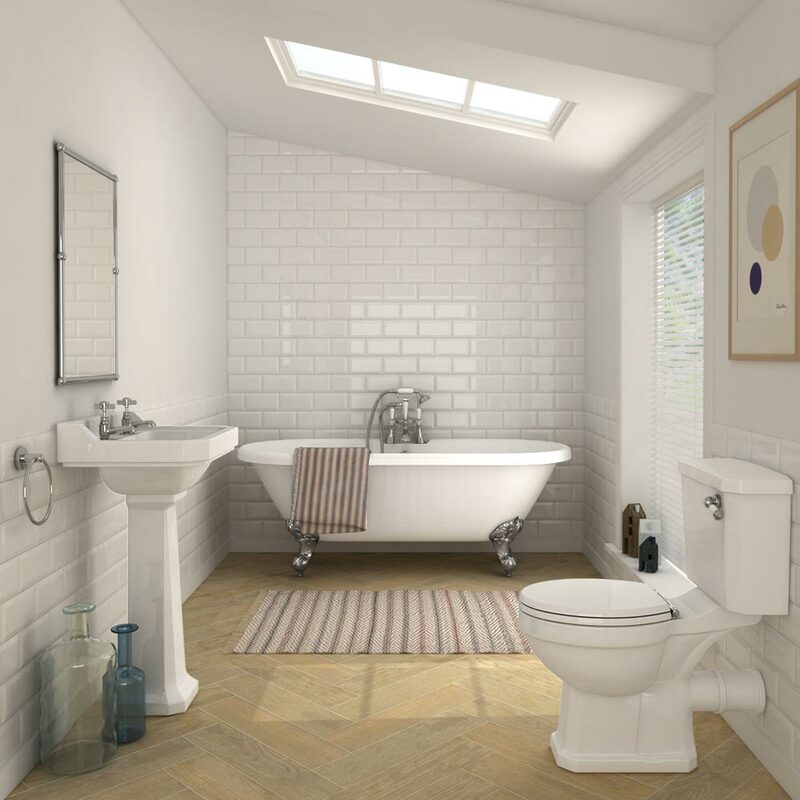 It features a double ended freestanding bath with a roll top design as well as a full pedestal basin and traditional close coupled toilet made from high quality Vitreous China. The bath’s ball and claw chrome feet really show this bath off in all of it’s beauty whilst the high quality basin and toilet really complement the whole package. The Belmont basin taps and Belmont bath taps pictured are not included unfortunately, but they can be found in our taps range. What could you buy with the change? 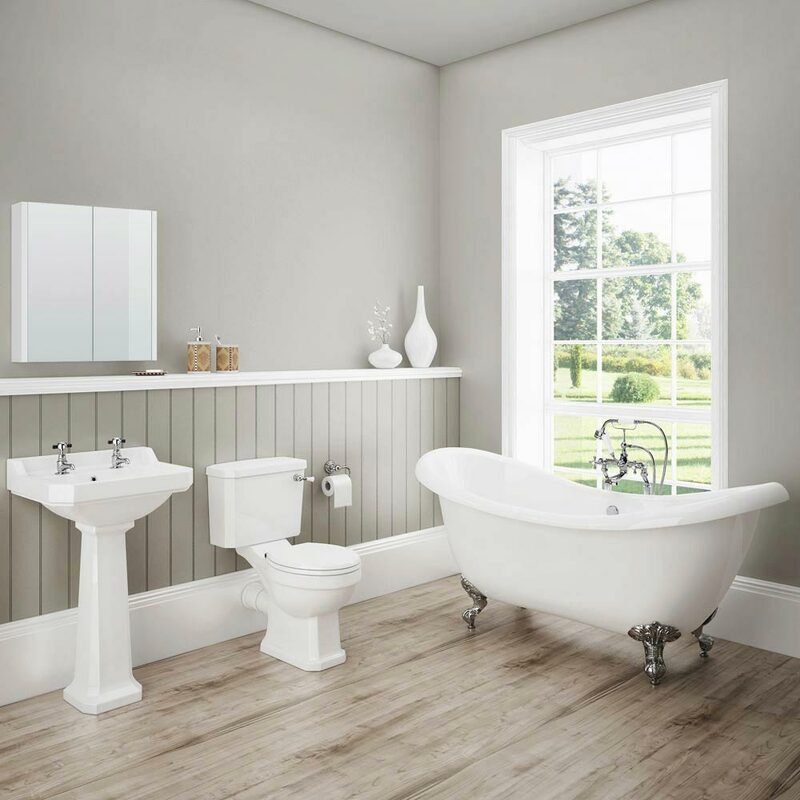 This bathroom suite comes well under budget which means you’ll be able to use your remaining budget to complete this suite with traditional basin taps and bath taps. Looking for something a bit different? Browse the York Traditional Bathroom Suite instead. The Cove bathroom suite is filled with modern luxury and style. The L-shaped bath allows for comfortable bathing and a luxurious showering area. This suite doesn’t just give your bathroom a trendy shower bath, it also includes the stunning Cove vanity unit with basin and a popular close coupled back to wall toilet. 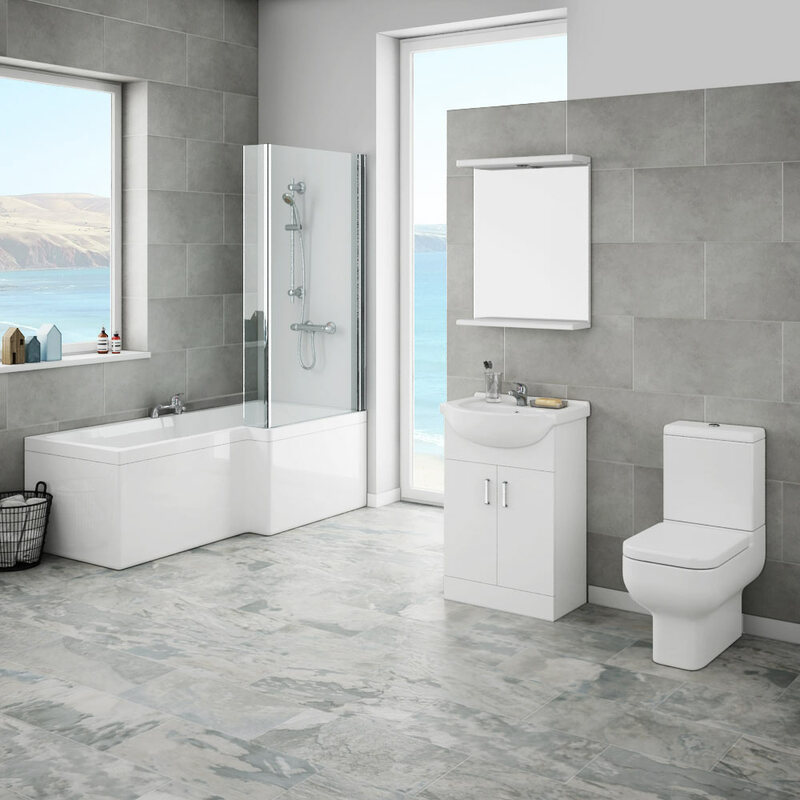 If you’re looking for high quality bathroom suite with a minimalist touch then the Cove modern suite is a fantastic choice. The vanity unit’s soft closing doors and smooth the ceramic finish of the basin both offer contemporary functionality and styling. This bathroom suite also helps save space which makes it perfect for the modern, family-sized bathroom. What could you buy with the change? Why not add the Cruze bathroom taps with what’s left from your budget. You might want to put the rest of your change towards a stylish acrylic end panel for the L-shaped shower bath too! Looking for something a bit different? Wave hello to this Turin Vanity Unit Suite with a Walk In Shower. When you’re shopping around for a higher end bathroom suite you’ll almost certainly fall in love with the opulence of the Darwin traditional bathroom suite. Its showstopping double ended roll top slipper bath will deliver an awe-inspiring look for years to come. This period-styled suite is completed with a traditional close coupled toilet and full pedestal basin. A high quality freestanding bath needs high quality fixtures and fittings to complement it and create that majestic grandeur. This is the reason why the Darwin traditional suite has proven extremely popular amongst those looking for luxury. What could you buy with the change? You could purchase a stunning set of traditional bath taps to help complement the beauty of your bath. If you’re looking for additional furniture and would like to complete this look you could buy the Turin 2-Door mirror cabinet as pictured! Looking for something a bit different? View the Keswick Traditional Roll Top Bath Suite. For the ultimate in contemporary elegance, cast your eyes on the Pro 600 modern freestanding bath suite. This bathroom suite is one of the most popular suites in our modern range and when you take a look at it, it’s easy to see why. The first thing in this bathroom that catches the eye is the gorgeous double ended modern freestanding bath. It really takes centre stage within the room, but the additional basin and toilet really help complement the whole style and work well together. The short projection toilet is a neat touch helping to save-space whilst still boasting lots of style. This modern bathroom suite is ideal for both large spaces and small bathrooms. What could you buy with the change? This beautiful bathroom suite comes well under budget which means you could use your change to decorate the bathroom walls and floor with tiles. Alternatively, you could add a matching set of stylish taps and a mirror! Looking for something a bit different? Take a look at the Turin Vanity Unit Suite and Modern Slipper Bath! As you can see, it doesn’t matter what your budget is there is a bathroom suite for everybody. Setting aside a budget for a suite is important to ensure that you don’t spend too much. As we’ve mentioned throughout this guide, a bathroom suite does not always include items like taps, flooring, wall decoration and showers. A typical bathroom suite comprises of a bath, basin and a toilet so make sure you factor in the cost of additional items you’ll need to complete your bathroom makeover. If you have all the extras but would just like to change the main items then feel free to go all in on your budget. Quality on a budget is a hard thing to find when buying anything yet bathrooms tend to be one of the rare areas where you can get excellent quality for a low price. If you want exceptional quality it does pay to spend more although mid range suites can really throw up some very well built offerings. Paying extra will obviously bring higher quality to your home and if that’s what you really want then a bigger budget will be a good idea. Style is never compromised when it comes to bathrooms and it’s not uncommon to see low budget bathroom suites looking just as good, if not better, than some of their higher priced rivals. Our advice is to pick something you think looks great and matches the price you’re happy to pay. We may have picked out 6 bathroom suites in our Special Edition WYB, however there are hundreds more to choose from. We hope you enjoyed this special feature of ‘What’s Your Budget?’ and have taken some ideas and inspiration from it for your next bathroom suite. We’d love to hear any suggestions, feedback or questions you may have so please leave a comment in the comments section below. Know a friend who may benefit from this feature? Please feel free to share it with them via email or social media using the social sharing buttons below.